The birds are really starting to make a racket at about 5am. 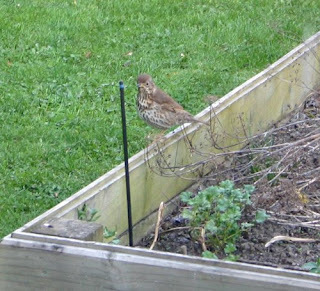 I think most of them are starlings & blackbirds but yesterday I saw this thrush. I kind of like thrushes, they seem like a chubby quiet type of bird. I particularly like their speckled breast. Tuesday 8 September - Happy Laundry Maid? Saturday 5th September - Creating!! !